Kindly remind: If you have any customization request, please contact with our customer service in advanced by email on amazon. Many thanks in advanced! VEER: VEER hair is Best 100% Remy Brazilian Human Hair,the best real human hair for you, no animal hair, no synthetic hair, lasting silky. HAIR TYPE: Real human hair,Best 100% Remy Brazilian Human Hair for female. HAIR LENGTHS:The hair length 10 12 14 16 18 20inch selected. HAIR TEXTURE:It is natural wave texture, Natural looking and soft touch. HAIR STYLE:Free style, no shedding and tangle-free, can be curled and straightened, cut and restyled you like, the hair look just like growing from your scalp. BASE DESIGN:French lace base have Strong breathable, the thin base is Soft and Comfortable. BASE SIZE:medium capsize in default. Customer Service:If you have any problems or suggestions about the product, please contact us via email,you will get reply in 24 hours. Thank you all,wish you will enjoy the product! 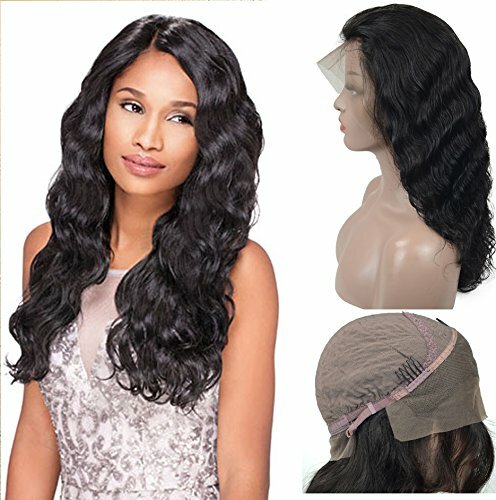 Material: Best 100% Remy Brazilian Human Hair Glueless Lace Front Wig with elastic bands and combs, 130% density wigs with baby hair that is soft, strong breathable cap and tangle-free without any shedding which you can feel comfortable, Body Wave Lace Front Human Hair Wigs looks 100% natural. Hair Color: Natural Color Hair Default that Can be Dyed and Bleached, If you want other colors, please contact us in advance. Cap Size&Hair Length: Medium Size Default, small size and large size need contact me in advance. The lace front wig with comb that can be adjusted,adjustable straps easy to wear; medium size(22.5" in stock) fits the majority of a woman's head. Hair length 12 14 16 inch in options, choose you like in stock. PERFECT GIFT: Our product is 100% odor-free and comes in a luxurious box ready to wrap for a birthday gift to your friends or to anyone close to you. Also you can wear it in many special occasions that gives you additional charming beauty and attractive looks. WARRANTY: You will get a period of fully supporting after purchase once you meet problems. If you have any questions about this product by Veer, contact us by completing and submitting the form below. If you are looking for a specif part number, please include it with your message.